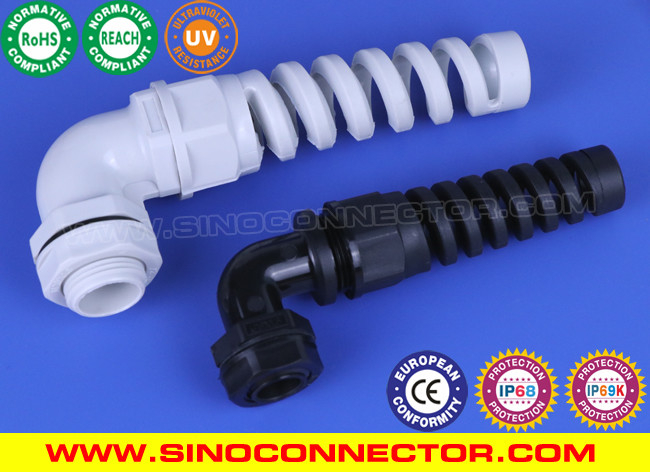 90° Elbow (Right Angle) IP68 Cable Glands with Spiral Flex & Bend Protection provide high stress relief, watertight airtight performance and cable protection against excessive flex and bend to reduce the risk of breakage. 90° Elbow (Right Angle) IP68 Cable Glands with Spiral Flex & Bend Protection can “reduce downtime, optimize reliability, and minimize the risk of intermittent connection failure in complex systems.” In other words, when you need to protect your connections from wear and tear in particularly demanding conditions, they are indispensable. 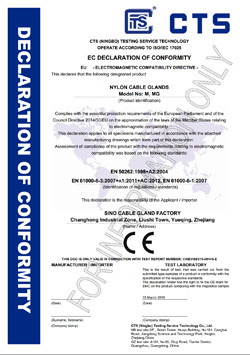 With its outstanding ability in weather resistance, strong tensile strength, high watertight & airtight performance and high security & stability, such glands are the best cable entry systems widely used for connecting and fastening flexible cables on hand-held equipments, moving machineries, telecommunications, network communication, automatic control, power supplies, switches, motors, distribution boxes, solar PV modules, Inverters, lightings, displays, traffics, signals, surveillance cameras, plant engineerings, meters and instruments, etc. Sizes available: M16x1.5, M20x1.5, M25x1.5. Raw material: UL-approved Polyamide 66, flammability 94V-2 for Spiral Protector, Locknut & Body (contact us for 94V-0 material). Weatherproof EPDM rubber for Seal & Washer. Standard colors: Light-grey RAL7035, black RAL9005 (special colors can be customized according to customer's request). Main advantages: Exquisite workmanship and beautiful appearance, unique design of claws and seals can provide strong strain relief and wider clamping range, it firmly holds and protects cables from excessive twist to reduce the risk of break. 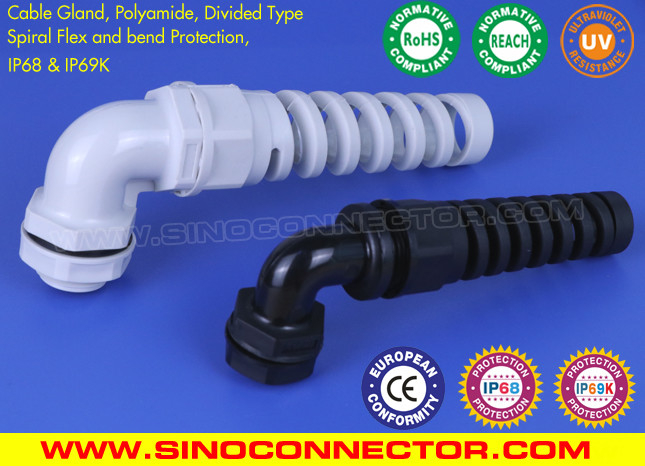 The flexible strain relief can protect the cable from excessive bend to reduce the risk of breakage. Resistant to salt water, weak acid, alcohol, oil, grease and common solvency. IP protection: IP68 (when the cable diameter is within the clamping range and assemble the Washer). Operation temp. : Static:-40℃ to100℃, short-term:120℃. Dynamic:-20℃ to 80℃, short-term:100 ℃. 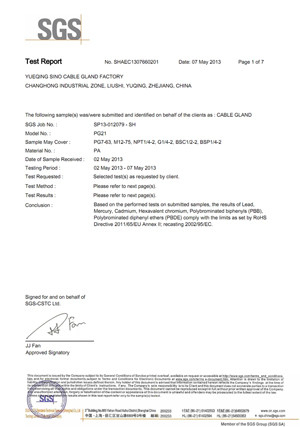 Quality grade: High quality can last 8-12 years of long service life for indoor applications & at least 5 years of long life for outdoor applications. Supply capability: 3,000,000 pieces per month. Samples available: Free samples is available upon request. Delivery time: Normally 5-7 days after confirmation of orders. Payment terms: T/T in advance, Western Union, L/C at sight. Shipment terms: Shipment by EMS / TNT / DHL / UPS / FEDEX, shipment by sea or by air.